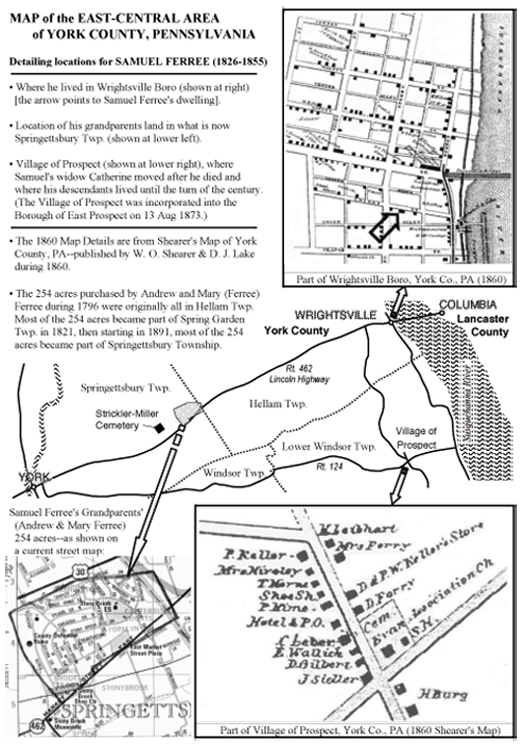 As a young man, Samuel Ferree, son of Jacob and Catherine Wagner Ferree, left the family farm in Lower Windsor Township, York County, Pennsylvania. The 1850 Census lists him in Wrightsville Boro in York County working as a laborer. There he met and married Catherine Hively, daughter of Samuel Hively. Tax records from the 1850's show that Samuel and Catherine Ferree owned land on Cherry Street in Wrightsville next to that of Samuel Hively, Catherine's father. (York County Deed Book 3X, page 588). Cherry Street was later named Chestnut Street and it is likely their house was located at what is now 127 Chestnut Street. Deed records from 1852 show they owned a house and 1/2 lot; 1853 owned a house and 1/4 lot; 1854 owned a house and 1/4 lot. Samuel died in 1855. Tax records for that year lists Widdow Ferry as owner of a house and 1/4 lot. It's thought this property was sold by Catherine Ferree about 1863. Samuel Ferree was born in 1826 and died in 1855. He is a direct descendant of Daniel Ferree and Marie Warenbur on three different lines; through two different sons of Daniel Ferree, Jr. and through Isaac and Catherine Ferree Lefevre. The link being marriage of Andrew Ferree, Sr. and Mary Ferree. For additional information go to this website's "Biography of Samuel Ferree". Map and information courtesy of Stephen H. Smith, great, great grandson of Samuel Ferree.